First up, I hadn’t expected the bottle to be so tiny! I got the 0.5oz one because it was smaller and I didn’t know if the product would work. But anyway, that’s just ignorance on my part. The bottle was completely sealed on the inside, which was good. Better than some items that just come with an extra internal lid that is unglued to the bottle so you could take it off. I was mildly surprised when I saw that the cream is yellow. 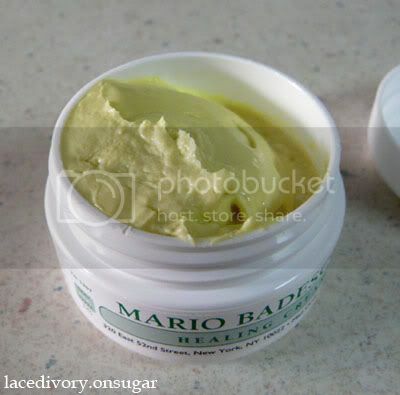 It looks like durian puree! lol. It doesn’t smell like durian but neither does it smell good. To be honest, it kind of stinks. However, this is expected since the ingredient list is pretty short. I can get used to it, especially if it works for me. I have it on my face now (under my Clinique’s Moisture Surge Extended Relief moisturiser) and I’m not breaking out nor are my spots turning red or anything. So far, so good. No allergic reaction yet and maybe it will actually work! 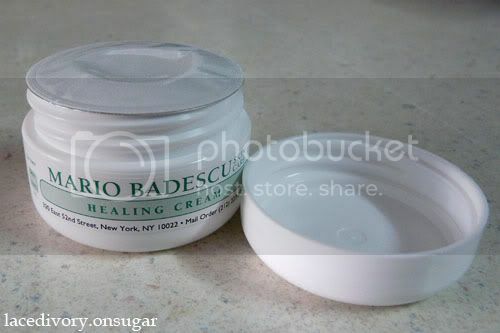 The cream goes on nicely and doesn’t add oil or shine to my skin, unlike what some pimple gels do. Although the cream is yellow, once it goes onto my skin, the yellow kind of disappears and I can’t detect it. I don’t expect a miracle like my spots disppearing overnight or over just a couple of usage. Like all medication, this will need time and I am going to find out how long it will take till I see results. So till then, I’ll keep my hopes high for this well-loved life saver! 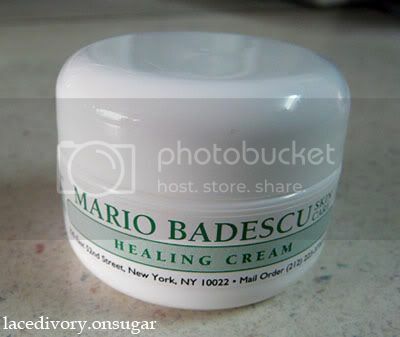 Mario Badescu’s Healing Cream was last modified: April 20th, 2010 by Roxanne C.